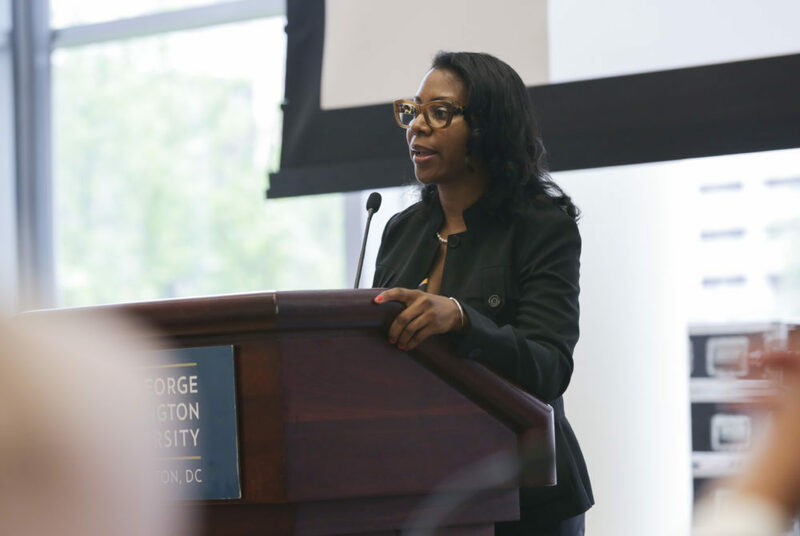 Venessa Marie Perry, the president of the Alumni Association, announced at a Board of Trustees meeting Friday that the organization will merge with GW's Office of Alumni Relations. The Alumni Association will merge with the Office of Alumni Relations this summer. The group will begin the process to join the University’s administrative office July 1, Alumni Association President Venessa Marie Perry announced at a Board of Trustees meeting Friday. Perry said the move will allow the association to become the premier alumni group at the University and open the organization to more administrative resources, like staff, funding and data. Perry said that after a task force – which focused on connecting the Alumni Association with alumni affinity groups – formed earlier this academic year, members decided the best way for the association to work with the University was to integrate with the office. Perry joked that the process has taken a toll on her approval rating, but said integration is necessary for growth. “We do believe this is what they set for us to rise to the level where we are really seen as a chief volunteer organization leading the charge in engaging alumni in volunteerism and philanthropy,” she said. Perry said the task force created sustainability and coordinating plans and drafted guidelines for the responsibilities of the different organizations after the merger. She added that the next step will be to create a new constitution and bylaws – a process that will begin next fiscal year. University spokeswoman Maralee Csellar said the Alumni Association currently has no plans to dissolve its status as a 501(c)(3) nonprofit corporation.